Aya Kamiki will be releasing her third album, “Are you happy now?” on September 9th under the GIZA label. The 14-track album includes her latest single, “Summer Memories” plus “SUNDAY MORNING”, “Kimi Sarishi Yuuwaku” and a premium track. The album will be release in three formats – CD (normal), CD+DVD (features music videos) and CD+DVD (features her Live Tour 2007). Album: Kamiki Aya: Are you happy now? Better late than never, but last week (August 12th), MUSIC★MUSUME turns one years old. Thanks to all of you for visiting this site over the year. Without you, MUSIC★MUSUME wouldn’t exist. I’ll continue bringing you the lastest JPop release information when it becomes available. See ya’! On October 22nd, Korean female group Tenjochiki (aka Cheon Sang Ji Hee the Grace) will be releasing their 7th Japanese single, “Here” featuring CLIFF EDGE. melody. 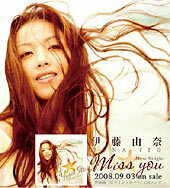 is set to release her first best-of album entitled, “The Best of melody. ~Timeline~” on October 8, 2008. The album includes her latest single, “Haruka” plus all of her A-sides since her debut single, “Dreamin’ Away” and a couple of B-sides. A bonus track is included on both CD and CD+DVD edition.